As an admiral, William McRaven traveled around the world. Now, as the new head of the University of Texas system, he’s been traveling across Texas. His most recent stop was at UT Arlington for a meeting with major donors. It was his first visit to North Texas as chancellor. McCraven has only been chancellor of the UT system for two weeks -- he’s still trying to meet all the presidents of the UT campuses. At this meeting of donors, he got to check UT Arlington President Vistasp Karbhari off the list. “If I have learned anything in the military, it was that great things are accomplished when you give great leaders an opportunity to do their job without a lot of interference,” McRaven told the gathering. McRaven is the former commander of U.S. Special Operations Command. His highest-profile mission was directing the raid that killed Osama bin Laden in 2011. The first things on his plate as chancellor are finding a new president for UT’s flagship campus in Austin, and working through various conflicts between the university system and the Texas state legislature. One of his goals as chancellor, he said, is to make sure that all actions of the UT system are ethical, legal and moral. “Without it, we’re dead in the water. With it, and with the good will and support of folks like you, there isn’t anything we can’t do,” he said. UT Arlington President Vistasp Karbhari. Karbhari wants UT Arlington to become a top 50 research university. He hopes that the new chancellor will make that easier. “The best thing he can do is support the ambitions of the each of our campuses. 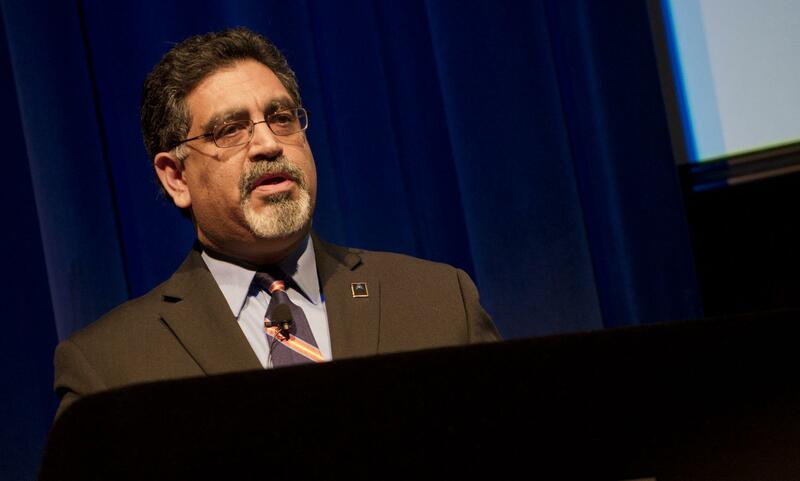 If you look at UT Arlington, we obviously have ambitions of being one of the best in the nation,” Karbhari said. UT Arlington has changed drastically as Dallas and Fort Worth have grown -- there are now 47,000 students in classes and online, almost double from a decade ago. “It’s probably the best held secret in the state of Texas. Most people probably don’t realize that this is not a small school anymore,” Karbhari said. Improving the school’s reputation for scholarship and research will require a lot of federal and state money, in addition to great faculty and buildings. In his role as chancellor, McRaven will spend time advocating for Texas universities on Capitol Hill in Washington, and cultivating major donors like the group he met in Arlington. He has lots of well-placed friends in Washington—one reason that he’s now one of the best paid leaders in higher education. His salary of $1.2 million has lots of potential for bonuses.